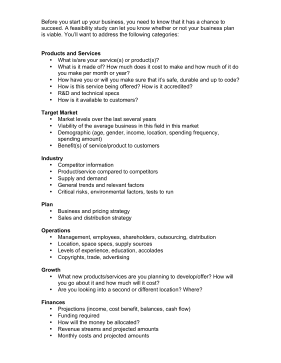 Before opening a business, answer the questions in this feasibility study to make sure the plan is viable. What is/are your service(s) or product(s)? What is it made of? How much does it cost to make and how much of it do you make per month or year? How have you or will you make sure that it's safe, durable and up to code? How is this service being offered? How is it accredited? How is it available to customers? What new products/services are you planning to develop/offer? How will you go about it and how much will it cost? Are you looking into a second or different location? Where?